Yes, mama tried, but sometimes daddy tries, too, and is just as wiped out at the end of the day. Trying to keep a toddler entertained for an entire day is quite the challenge. Needless to say it’s been a long day. Some friends are over to entertain the toddler at the moment so I was able to steal away a few moments to do some work. I put this on while I was working and I’m glad I did. 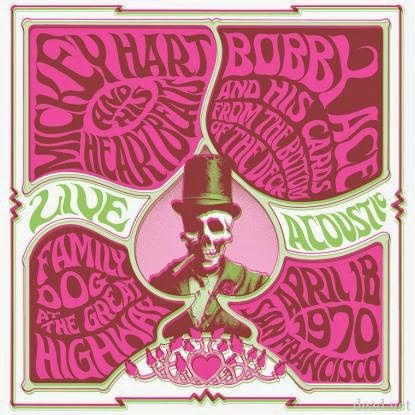 When this release was announced the big to do was about the mini set from Pigpen at the end. However, the track that stood out to me the most was the version of Mama Tried. It’s not just the acoustic rendition, which is, of course, pleasing, but the entire arrangement is different. Most noticeable is the fingerpicking guitar part. I absolutely love it in this version, but at the same time I can see (or rather hear?) how it might not have translated as well with the full electric band. It’s got a sense of fragility and nuance that can be lost in the sonic bombast that is the Grateful Dead. But here, in the quiet acoustic nook of the Family Dog, a song we’ve heard hundreds of time is given new life. Forrest Gump famously said that life is like a box of chocolates and you never know what you’re gonna get. It’s fair to say that swapping out “box of chocolates” for “Grateful Dead” would be just as, if not even more, accurate. Tagged 1970, 1970s, Acoustic, Family Dog, San Francisco CA. Bookmark the permalink. Jerry had a two-fer earlier, so why not Bobby? Dawson plays the harmonizer again, singing all words in the verses and choruses. Garcia sticks to guitar and doesn’t sing. This is plenty, as he wails expert country licks. This is one of my favorite arrangements of this song. The second solo is played on acoustic guitar, and I’m guessing that is David Nelson because there is no way Weir could play that way. The band plays the country intro and outro, something dropped in later versions. Love it.